The Australia-Cuba Friendship Society was established in 1982, with branches in all Australian states as well as fraternal groups in a number of New Zealand cities. To co-ordinate our work more effectively and exchange news and views we hold an annual two-day National Consultation in different states in a central location. But we all have a common aim in promoting friendship and support for the Cuban people by raising awareness among Australians about Washington's long economic/political blockade and its attempts to subvert and destroy Cuba's great revolutionary achievements, especially in health and education. 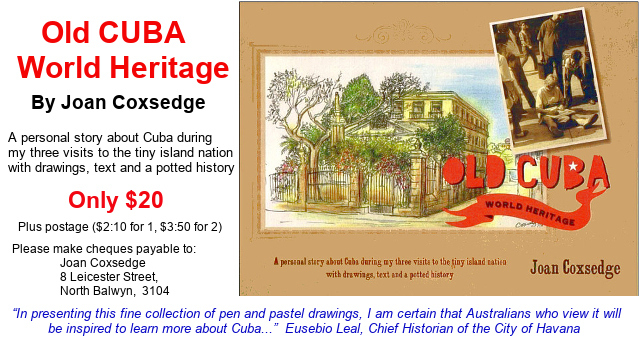 The Melbourne ACFS meets monthly, puts out a regular newsletter and holds fund-raising functions for specific projects, which are determined by the Cubans themselves. As examples, the ACFS has contributed towards the cost of completing a project to improve conditions at a primary boarding school and to help Cuba's Hurricane Relief Appeal. Since 1984, the ACFS has organised an annual four-week Southern Cross Work/Study Brigade to give Australians and New Zealanders the opportunity to see Cuba from the 'inside', visiting schools, hospitals, factories, picking fruit, and the highlight - spending a few days with a Cuban family - all of which builds bridges of understanding among our two peoples. The brigade, which leaves Australia at the end of December, is a great leveller and attracts people of all ages and from all walks of life. Melbourne ACFS meets on the first Monday of the month at the Melbourne Unitarian Church, 110 Grey St, East Melbourne at 7.30pm. New members are warmly welcomed.